New Enemies! The Sailor Soldiers are back on the job! Usagi and her friends would've enjoyed the peaceful rest since their last battle, but they're been studying for their high school entrance exams! Unbeknowst to them, the evil Professor Tomoe and Kaorinite are plotting to conquer the world by harnessing a mysterious power found only in pure hearts. Dreams of a first kiss or honest feelings of love and admiration make innocent people targets for their sinister plan. As the Sailor Soldiers fight to stop the professor's deadly minions from staling heart crystals, they are aided by two mysterious warriors, who have their own motives. Can they all set aside their differences to prevent a world catastrophe from occuring? Finally, after such a long wait, Sailor Moon is available commercially subtitled in America. The first release of the TV series makes a bang, definitely setting some standards in some aspects for anime DVDs. While the releases start off with the third season, not seeing the first two doesn't lower the level of enjoyment of the series. Pioneer definitely did a good job in starting off the releases for Sailor Moon S.
When I got this disc, I fully watched it through in both languages. I first watched it in Japanese, where even though the track is in mono, still sounds good with my speaker setup. Listening to the disc in English, however, was a bit of a letdown. Since this is supposed to be an uncut dub, I was hoping that some aspects might be redubbed from the edited dub. What really happened, is that the video remained untouched, but the edited dub track was laid over it. While I can understand that doing a redub, even of select line for each episode, would cost money, I don't agree with putting the dub track for the edited dub over the uncut video. The dub really isn't uncut then, which defeats the purpose of an uncut DVD. Over six months went from the dubbing of the show to the DVD release, more than enough time to make improvements for the uncut release (hell, CWi dubbed over 70 episodes in that short time). 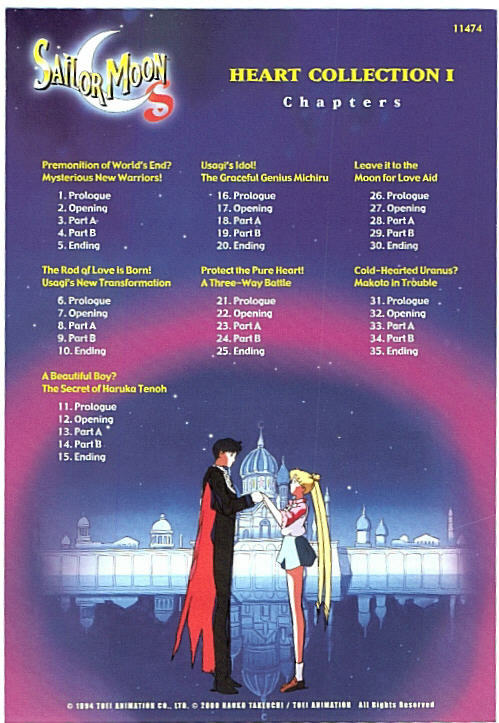 If you plan on getting this DVD to see the uncut version of Sailor Moon S, don't watch it with the English track. If you do decide to watch it with the English track, there are times when the track overpowers the background music track, which can be annoying at times as the music is a key part of the show. Even with its age, the video quality of the DVD is pretty good. English text credits were overlaid into the opening and ending sequences. While they mixed them in pretty well with the opening, I disagree with how they were handled in the ending. Instead of placing them where they had been originally, they just had them scroll down the center of the screen, blocking the images that were meant to be seen. Pioneer knew how to please Sailor Moon fans as the packaging for this release is possibly among the best of most anime DVDs. 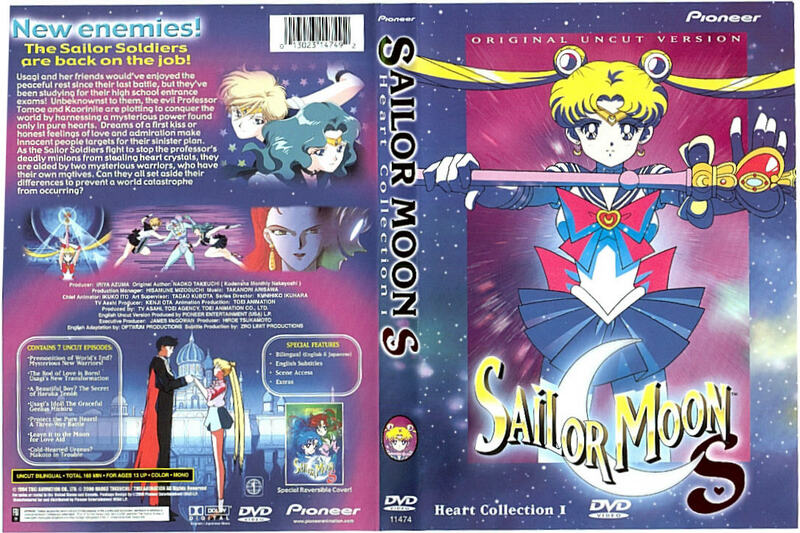 The front cover of the DVD was originally a shot of Sailor Moon doing her Moon Gorgeous Meditation attack from SuperS, in which Pioneer cleverly edited the image to her wearing her cosmic fuku and holding the Spiral Moon Heart Rod. This change along with a nice starry background made an excellent front cover, as well as foil-plating the S in the logo. The back cover has the same background colors as the front, mixing in with screenshots from the episodes on the DVD as well as all the info. With this release, Pioneer set the standard for reversible covers, as instead of white space, the back of the cover had a second cover which was taken from the second LaserDisc release in Japan, with a mix of pictures of episodes on the DVD. The case is a clear case, so you can see the other cover when you open the case, which adds a really nice touch. The spine was also done well, featuring a small pic of Sailor Moon as seen on the front cover, with Sailor Moon S plated with foil. The reverse spine was done in the same way, having a small pic of Sailor Mercury and Sailor Jupiter instead. However, Sailor Moon S was not foil plated in the reverse cover spine, and neither was the S in the logo on the reverse cover. This was a bit of a let down for me, as assuming they continue the trend throughout S, mixing which covers to use throughout the releases would look a tad strange on the shelf, with some shining and some not. That's the only downside though, and the DVD insert is done pretty well, containing a scene index using a pic from the second episode and the same blue-purpleish background used for the front cover. I would've liked to see the episodes numbered somehow, but at least the chapters make it able to tell the order of the episodes on the disc. The menus are pretty nice for the most part. Navigating through them is easy, though seeing the animations again and again can get a bit annoying. Better quality images could've been used as well, just seemed a bit grainy to me I suppose. It's a step down from the excellent menus used for the movies. Also, the scene index was broken up by chapters rather than episode numbers. While there was not much for extras, what was there was done very well. There was the Sailor Gallery, in which there was an extensive profile of Sailor Moon, as well as some pictures to go through. The really cool thing was the textless/karaoke opening sequence. With this, you could watch the opening sequence without kanji or credits. You can turn the vocals on or off, as well as the subtitles, so you can sing along. The subtitles were done nicely, as they appeared white, and gradually turned green as the words were being sung. Being a big fan of Sailor Moon, I was happy to see Sailor Moon S finally come over to this side of the ocean. Sailor Moon was one of the first anime (if not the first) I had ever seen, getting into the dub a little bit back when the show and DBZ were originally on syndication in the early morning, and got hooked when it came to Toonami and I finally got cable and found it again by accident. I eventually acquired fansubs to see the rest, of which back then was branded as "would never come to America," as well as the VHS subs of the movies, and then was excited when dubs and DVDs were announced for S and SuperS. Being such a big fan, it was one of the main reasons I got a PS2, so I could be ready to get the DVDs. Doing so paved the way of my love of anime growing so rapidly, and I'm proud to say I was not disappointed by the release. 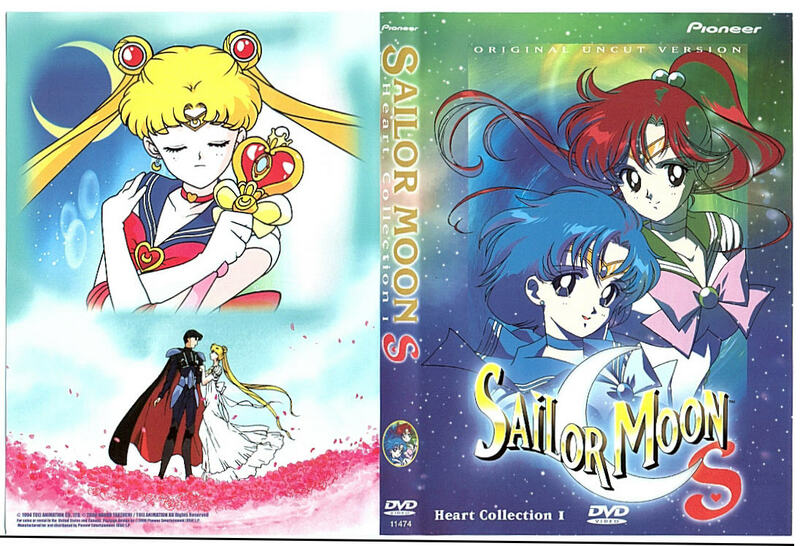 The release of Sailor Moon S on DVD was definitely given the treatment it deserves. As with every release, this one has its downsides, many of which I mentioned above already. Only a couple things irked me, one of which being the absence of the next episode previews. While as I said above, I can understand not redubbing anything, assuming that these were cut because they weren't dubbed, I think that Pioneer should've taken the time to dub them. Another thing I didn't like too much was that they used the wrong opening sequences in the episodes. Originally, there was one used for the first two episodes, then another one from the third episode until about halfway, then there was one used from halfway to the end, which is the one Pioneer decided to use. I can see why they decided to use it, as there was a kanji-less credit-less version of it, but I feel that the correct openings should be used since they were meant to go along with the storyline of the season. That all being said, everything else was done well, and I especially liked that they did do the right endings, using "Otome no Policy" for the first two episodes, and "Tuxedo Mirage" for the rest. While this is the third season being released onto DVD first, the way the season starts out, it's not completely necessary to see the first two seasons to start watching the third. It'll just take a couple episodes or so to get familiar with the characters, that's all. It might be a tad tough to keep up since you'll be meeting new characters along the way, but there's enough episodes in the season to break into it. It all starts out with Rei having bad dreams. Her dream consists of a silence coming to the world, destroying everything in its path. Suddenly a beam of light appears, splits into three lights, then fade away in the distance. Rei tries to figure out the meaning of the dream, but as she leaves the temple, she's attacked by a monster. The rest of the senshi come to her aid, the monster appears to be too much for them, and it even destroys Sailor Moon's brooch, rendering her powerless. The monster shoots a black beam at Rei, and using it takes out a crystal, the crystal of Rei's pure heart. Just as all hope is lost, two beams of light come from nowhere and destroy the monster. The blasts came from two new senshi, who checked out the pure heart crystal as the other senshi went to check Rei, decided that it wasn't the one they were looking for, and left unnoticed. We soon find out that the two mysterious soldiers from earlier, are Sailor Soldiers as well. Sailor Neptune and Sailor Uranus are very different from their inner counterparts. Unlike the inners, the outers' mission is to find the Talismans and obtain the Sacred Cup to find the Messiah, and save the world from the silence. The outers refuse to work with the inners because they feel they are weak, are a burden, and can't handle the fact that people must be sacrificed for the good of the universe. And thus, the stage is set for the first batch of S episodes. Pioneer did a great job putting this disc together, pleasing all fans of the seires. If you have a DVD player (and you should by now), definitely pick up this disc. This series can be enjoyed by almost anyone, and is treated very well with the packaging, high episode count per disc, and a good price for all that.